The lower side of 27.385.00 MHz, or channel 38 as it’s also referred, is maybe the most popular call frequency on the eleven meter band. Not so much for the generous number of DXCC (or divisions) you can work there, rather in terms of the extreme amount of DX signals it supports. Often, the noise on this frequency is characterised by a thunderous 5/9 wall of DX, a feature confirmed by the numerous YouTube videos at the bottom of this article. Like with any 11m call frequency though, there are drawbacks and benefits of use which can make it either a wonderful setting to enjoy your hobby or give you a reason to switch the rig off and head elsewhere. Evidence shows that 27.385 MHz LSB is the main meeting point for citizens band (CB) radio enthusiasts in the United States (2 division), Canada (9 division), Alaska (33 division) and the Hawaiian Islands (17 division). To a lesser extent, this frequency is also drawn on by ops in Australia (43 division) and New Zealand (41 division) calling “CQ State-side”, by the occasional Europe based operator and also by those in small Pacific DXCC in such as the Federated States of Micronesia (230 division), Marianas Islands (133 division) and Marshall islands (132 division). No doubt these ‘more reserved’ individuals are lured to this particular frequency when the band is open due to the massive amount of DX signals present. 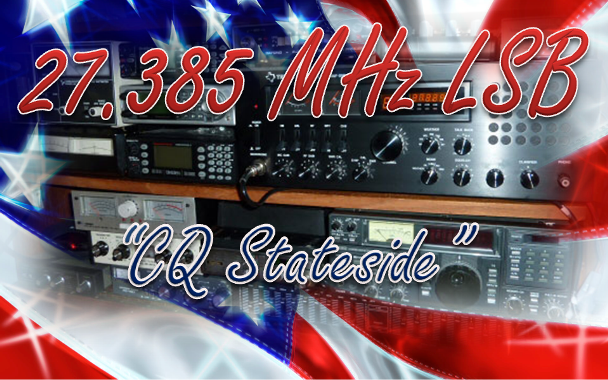 In addition to being an ideal site to target 1 or more of the 52 US states as well as some juicy oceanic DXCC, one of the best advantages of 27.385 MHz LSB as a call frequency is that it lies within the legal allocation for CB. This means that it’s available via the channel dial on any stock standard 27 MHz radio sold in the present day market and doesn’t require a modified CB or ham rig to get there. Essentially, not one 11m call frequency demands the same operating protocols as another. On the ‘international’ call frequencies, for example, the standard etiquette is “make your CQ call and then QSY to another frequency”. 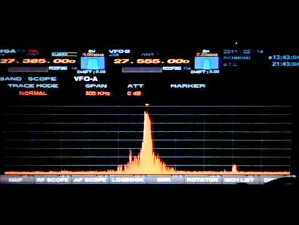 The accepted protocols on 27.385 MHz LSB, however, are far less considered. Here, the operating custom is more a disproportionate blend of meaningful CQ DX calls and light-hearted QSO; behaviours which generally coexist in harmony on the same frequency yet sometimes create some frustration. This is in no way a reflection of the standard of operator who uses this frequency, more a description of the colourful operating culture which has become the norm in the last 3 decades. 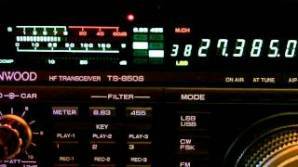 While some do QSY from channel 38 LSB when a contact has been made, it’s not atypical for most ops to make a call and then enjoy a QSO on the same stage, knowing their voice is being heard in different parts of the world by thousands of different stations waiting to make their call. Perhaps this is what makes the practice so appealing?!?!?! In any case, loads of ops who use this frequency appear to be licensed hams whom enjoy the laid-back atmosphere of the citizens band to ragchew with friends or chase DX. Generally speaking, they use their access to linear amplifiers, ham transceivers and monster antenna arrays to full advantage too, creating big signals from big stations to ensure their voice is heard above the QRM. 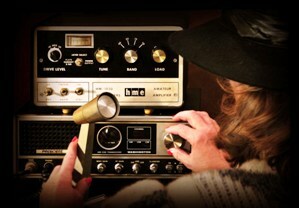 Many are guys who belong to famous cb radio clubs like World Radio, Radio Canada and American Eagle with reputations to uphold. Some are also DA-RC members whom are recognisable by their unique Delta-Alfa callsign and 4 digit unit number. Regardless of the club though, there’s no doubt you’ll find some outstanding contacts on this part of the CB when the 5/9 wall of DX is up and Stateside is pumping through. While the protocols of 27.385 LSB are lax though, the basic rules of courtesy when calling and listening should still apply. 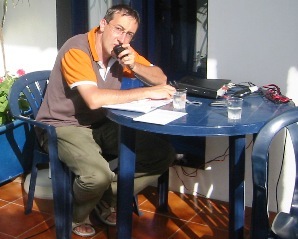 Try listening for a ‘break’ on the frequency, making a CQ call, and then QSY’ing to a nearby channel to enjoy a QSO. Not only will it give you the opportunity to enjoy a less stressful QSO minus the QRM of constant calling and chatting, but it will also help clear the frequency for other users. A facebook site has been set up to keep CB users abreast of what’s happening on this frequency, allowing them to communicate with some of the personalities likely to be heard there from time to time. Click HERE for more info. nice page. looking to stop back again. is it possible to find some truck drivers they are interested at dx at this frequency? Yes. 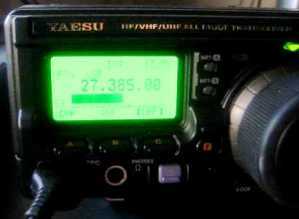 There are quite a lot of us Truckers on SSB shooting DX. Mainly 38LSB but, you’ll find us on adjacent channels if 38 is busy busy. I really miss all the skips on 38 LSB these past few years. That sound could babysit me throughout the day!!!! Listening to all the operators from the east coast in the morning to the pacific in the afternoon. Hams complain about us 11m ops but most of the time when 11m is pumping, NO ONE on 10m. How’s that?! 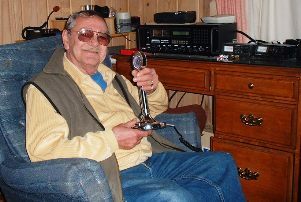 Well said Seymor,i share exactly your comments.Do expect a very short “qso” more just a quick hello as it is one on top of the other on 38 lsb.I used this channel in ’70’s but not much since.I still hear the expression: “qrt and standing by”. makes me laugh out loud !!! I only use that frequency for a quick check on how the propagation is doing,never have I attempted a QSO and anyway its rather more chaotic than fun. The same mentality as on channel 6 AM (superbowl) exists on 38 LSB,this is sad…but I did here some DX from Australia,New Zealand, Hawaii,Germany,etc. through that wall of noise from my QTH here in the “cold country”. They’re all welcome on .555 but please use the recognized international call sign method and do not monopolise the call frequency with qso’s and oh…..please turn off that echo box and triple roger beep. Great article! I really like listening across the full spectrum of 11 meters and often sit on 27.385 MHz LSB and listen to some of the ‘Big Guns’ blow smoke. I would encourage any avid DXer to cut away from ‘555’ occasionally and drop the line in on other frequencies. You never know what you’ll catch!